We write resumes that make employers take notice. – To use our online scheduler, click here. 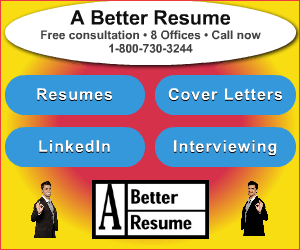 A Better Resume Service has a deep, rich history of providing the highest quality of resume writing and career services. Over the last 20 years, we have assisted thousands of individuals seeking new employment or advancing their careers. Our clients have included people at all levels, from mail clerk to CEO, and in all industries: accountants, educators, engineers, physicians, marketing executives and financial advisors. Today, we are the oldest and largest resume development firm in the Chicagoland area, with ten locations to meet your needs wherever you live or work. Since 1986, as one of the top 10 ten resume writing services in the U.S., our writers have given job seekers the tools they need to win interviews in competitive markets. We know the Midwest employment environment. View our “Locations” page for a writer in your neighborhood. Our services are provided according to the needs of our clients. Our clients are diverse, with every person having a unique background. Every new client is treated as an individual who needs special attention to accomplish his or her goals. We work with our clients in person because, unlike other services, you are not just a datastream. Resume services are available alone, or as part of packages that include items such as cover letters, and PDF files. – To use our online scheduler and save $25, click here. « Inspirational Quotes for 2018 – A Great New Year!